PARIS — Satellite fleet operator SES on April 7 said it was ready to invest in satellite in-orbit refueling and in-orbit payload swaps in addition to its previously stated willingness to be the first customer to use a refurbished SpaceX Falcon 9 first stage for a launch. In its annual report to investors, released after Luxembourg-based SES’s annual shareholder meeting, the company presented itself as pushing the envelope of new rocket and satellite technologies even as it keeps focused on the bottom line and increases its dividend. The shareholders approved a 10 percent dividend increase, giving the stock 5 percent return based on its closing price on April 7. The two in-orbit servicing projects take different approaches. Orbital ATK’s Vivisat launches a small vehicle that latches onto the target communications satellite and stays attached to it, providing fuel. MDA Corp. has designed an in-orbit fuel depot that would visit satellites, fuel them and then leave to service other customers. SES has said previously that it had been working on a connector device that it would add to its satellites to enable them to be easily grappled in orbit to allow payloads to be changed with the evolution of demand. The company had suggested it would launch the first of these servicing-friendly devices on the SES-16, owned by LuxGovSat, a joint venture between SES and the Luxembourg government to provide connectivity to the Luxembourg Defense Ministry and other NATO allies. The final design of SES-16, now under construction, did not include the connector. But with a 52-satellite fleet, SES needs to launch at least three satellites per year, every year, just to maintain its current business. Opportunities are not lacking. The third element of SES’s strategy to optimize spending on satellites is based on reusable rockets. The company has been the single biggest commercial booster of Hawthorne, California-based SpaceX, whose Falcon 9 rocket’s first stage is designed to return to Earth, land upright and then be reused. SES plans to launch seven satellites by late 2017– three in 2016 and four in 2017 – of which five are slated for SpaceX Falcon 9 missions, with two on Europe’s Ariane 5 rocket. The first of the seven, SES-9, was successfully launched in March aboard a Falcon 9. Perhaps to exhibit a balance in its launcher considerations, SES in its annual report lauded the European Space Agency’s review of reusability options for the coming Ariane 6 rocket. In fact, Ariane 6’s design includes no reusability features and the rocket itself will not launch until 2020. European governments have invested only in low-budget studies of reusability features and may increase their investment when the meet in December. But no major effort is expected. — The seven satellites to be launched in 2016 and 2017 will generate between 250 million and 300 million euros ($273 million to $328 million) in incremental revenue for the company once they are in full operations, equivalent to 15 percent of SES’s 205 revenue. The biggest of the three – SES-12, SES-14 and SES-15 – represent an investment of 1 billion euros including construction, launch and insurance. 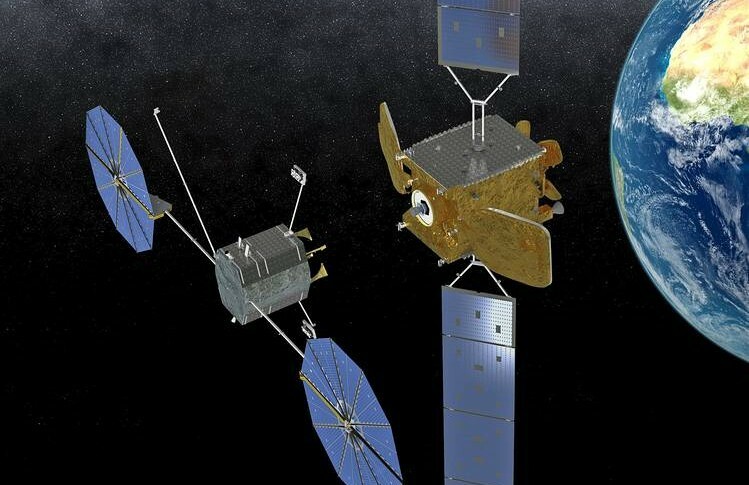 — Despite the stagnant spending on commercial satellite bandwidth by the U.S. Defense Department, demand from the global civil government sector, and from military agencies outside the United States, is growing. The SES Government division’s 2015 revenue of 255.6 million euros was up 18.8 percent over 2014, although a portion of the increase was due to foreign-exchange fluctuations. SES said it signed contracts in 2015 with five new government customers, including a Canadian regional government, and that revenue from government partnerships such as this accounted for 3 percent of the company’s total 2015 revenue, up from 1.5 percent in 2013. “We expect the Government segment to be one of the fastest-growing verticals for SES in 2016 and beyond,” the company said.